After the last update, I had exactly 199 projection images in the list of my website. Of course, these were not 199 distinct projections, since a number of projections are shown in different configurations. Nevertheless, I wanted something special for the No. 200. And I think I succeeded! 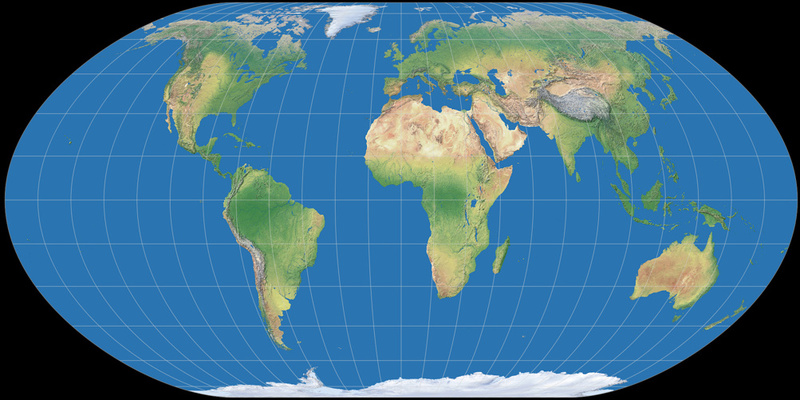 The Sinucyli projection is an equal-area pseudocylindrical projection. That’s nothing special, there are dozens of them. It is a blend of cylindrical equal-area and sinusoidal projection. This is also nothing special, blending projections is a well-known procedure: the famous Winkel Tripel, for example, is the arithmetic mean of the equirectangular and the Aitoff projection. The Flex Projector software allows two arbitrary projections to be mixed – including the two parent projections of Sinucyli. By modifying four easy-to-understand configuration parameters, the blend of the two parent projections can be customized to your own requirements. This leads to very different results (some examples follow below). Let me emphasize: You blend two arbitrary equal-area projections, and the resulting projection is – in contrast to other methods of blending existing projections, e.g. the above-mentioned arithmetic mean – equal-area as well! A nifty feature, since equivalence is a very useful property for many purposes. But now, let’s return to the specific example of blending cylindrical equal-area and sinusoidal projections and take a closer look at the four configuration parameters I mentioned. Weight of sinusoidal determines the proportion of the contribution from the sinusoidal projection. A value of 1 will result in the sinusoidal projection as we know it – meaning there’s no blending at all. That’s probably not what you will want to do [Update:] if you want to create a single projection; it might be useful though for dynamic mapping and animations. With a value of 0.5, as shown in the screenshot, the resultant map receives equal contribution from both source maps. Weighted axis determines whether the above value refers to the horizontal or vertical axis of the sinusoidal projection. This doesn’t sound as easy to understand as I promised above – but basically, the vertical setting produces a projection with a pointed pole, whereas horizontal will result in a pole line. 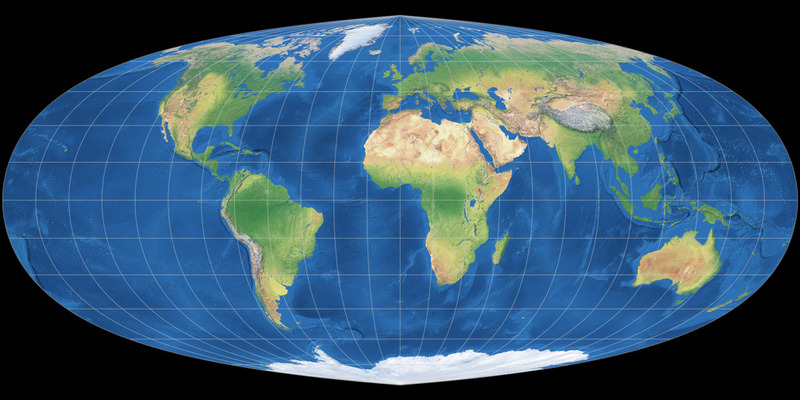 φ1 is the standard parallel of the cylindrical projection thrown into the mix – as usual, a lower value generates will stretch the map horizontally, a higher value stretches vertically. Vertical stretch of sinusoidal modifies the aspect ratio of the sinusoidal component. Values greater than 1 stretch vertically, values between 0 and 1 increase the width. It may seem as if parameters #3 and #4 have more or less the same effect. In fact, however, they are different – and I would like to show this using the following example. – Both maps were created with a weighting of 0.7, and with the selection horizontal for the weighted axis. – For the left map, a value of φ1 = 0 was selected – a value that stretches horizontally –, which was compensated by the vertical stretch of 2. – For the right map I did exactly the opposite: φ1 = 80°N is stretching in north-south-direction, the vertical stretch of 0.93 counteracts this. I think it is easy to understand what the individual values say – at least when you have experimented with them a bit. Now, let’s look at the three variants that I have included on the website. The first one is the configuration which was already shown in the screenshot above; with the parameters 0.5 / Vertical / 29°30´N / 1 it represents a good starting point for your own experiments. The second one (0.25 / Vertical / 29°30´N / 1.1) shows a projection approaching a rectangular shape, but with a pointed pole. The third, on the other hand, using the values 0.8 / Horizontal / 30°N / 1, approaches the sinusoidal, but has a short pole line. It is not surprising that other equal-area pseudocylindricals can be approximated using the Sinucyli projection, or that they are even identical. For example Kavraisky V, Quartic Authalic, Eckert IV, Thomas-MyBryde flat-pole quartic and Wagner IV each fall into one of these two categories. It starts with a weighting of 1 and the weighted axis set to vertical, decreases the weighting gradually to zero, where it switches to the horizontal axis and increases the weighting again towards 1. Click here to view the animation! Let me emphasize once again: You won’t produce surprising, unusual results with the Sinucyli projection! I guess this is hardly possible anyways given the thought that the family of pseudocylindric equal-area projections probably already has more members than any other kind. 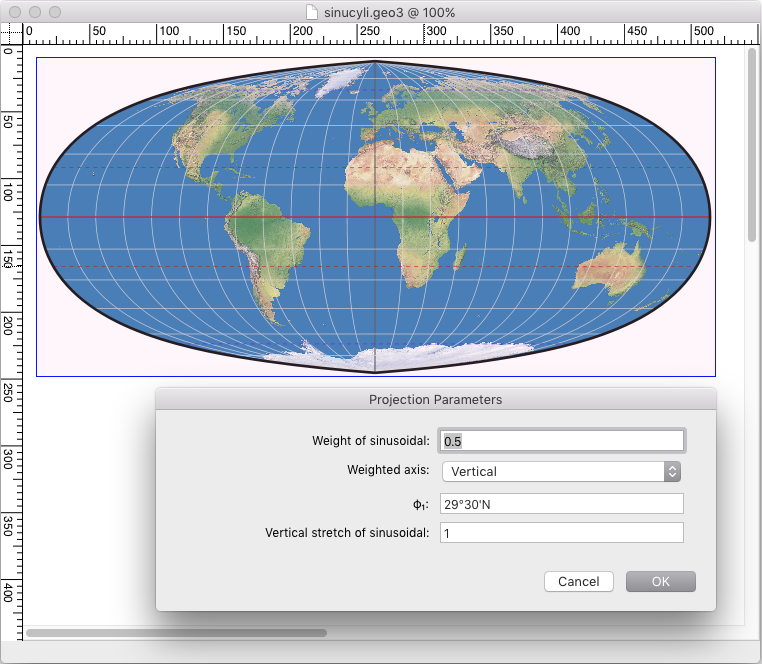 But the ability to easily create your own configuration is in my opinion useful enough to be seen as a valuable addition to the world of map projections. So, how can you use the Sinucyli projection? Now the bad news is coming: At the moment, not at all. It will be included in the next version of the map projection software Geocart – but the release date of that version hasn’t been announced yet and I guess it’s safe to say that it’s still several months away. As soon as daan Strebe publishes the formula, it can of course be integrated into any other map projection applications. I will report it here as soon as a corresponding publication is available. Update! 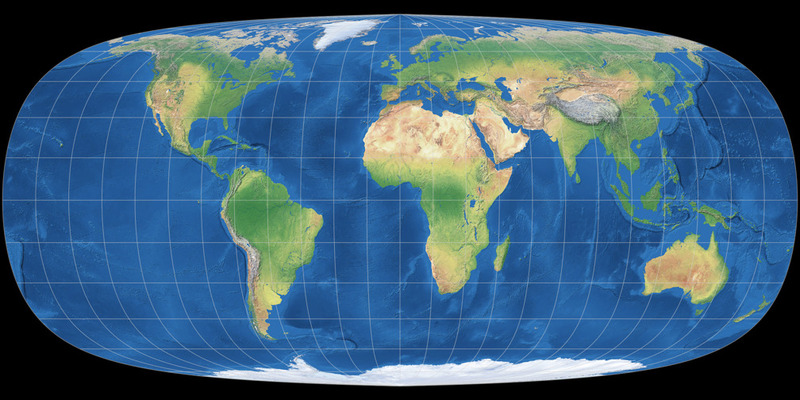 Version 3.2 of Geocart has been released in Feb 2018 and offers the Sinucyli projection (among a lot of other additional projections). 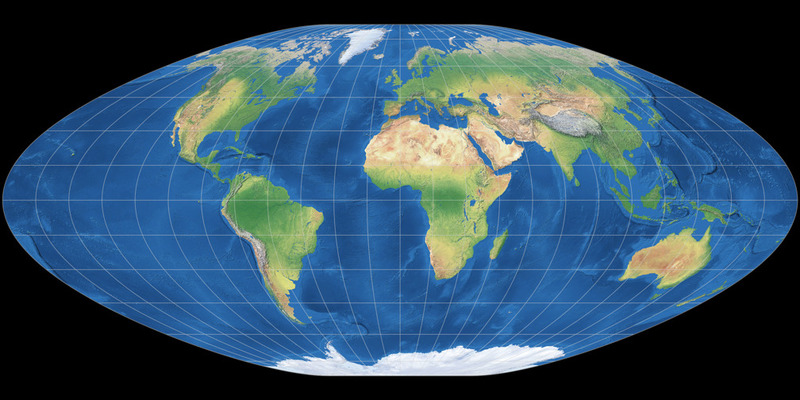 The technique has been introduced officially (see below) and thus, can be used in other map projection applications. ↑ Quoting from the introduction of the blending technique. The paper is available online, see daan Strebe’s note in the Geocart forum. Please leave the following four input field blank in any case! So presumably the Foucaut Sinusoidal is some sort of reduced case of this? When setting the weighted axis to vertical, φ1 = 0 and vertical stretch = 0, the Sinucyli formula will render an instance of Foucaut’s projection with the identical value for the weighting.